A measles outbreak in the Pacific Northwest has some questioning religious exemptions for families who want their children to opt-out of mandatory immunizations. 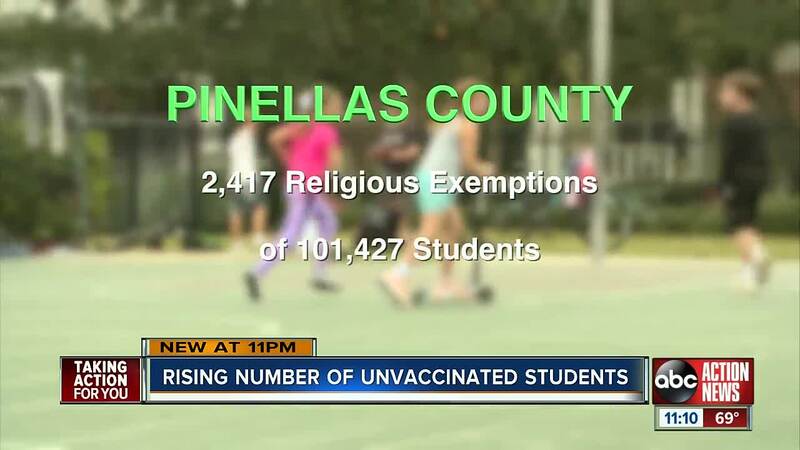 TAMPA, Fla. — A measles outbreak in the Pacific Northwest has some people questioning religious exemptions for families who want their children to opt-out of mandatory immunizations. Florida is one of 17 states that allows the exemption based on religious grounds. Many parents worry vaccinations pose a threat to their child's health. "My son is going to need lifelong care and that is a tragedy. If I had the information, I don't know if I would have made the same decisions because where there is risk, there should be choice," Maureen van Hoek told ABC Action News in 2017. ABC Action News has obtained public health records detailing how many unvaccinated children attend Tampa Bay area schools. In Pinellas County, more than 2,400 students received a religious exemption for this school year, which breaks down to more than 2% of the overall student population. State records show Sarasota County has the highest number of unvaccinated students. More than 4% of students there received a religious exemption. That number jumps to 7% for kindergarten students. "If we have something that we can do to help protect a child, protect other people, I think they should not have religious exemption," said Dr. Meredith Plant with USF Health. Dr. Plant admits she struggled with the decision for her own children. But believes vaccinations are a parent's best options for helping protect their students from dangerous outbreaks. "The vaccines are safe. They work great and I think it’s one of the most important things you can really do for your child," said Dr. Plant. More information on vaccination numbers across the state can be found on the Florida Health website .